The Global Express: Who Destroyed Newspapers? Runesmith's Canadian Content: Campaign Lessons Learned: What Would Don Draper Do? Bellingham on behalf of Rep. The Progressive Right: The Shock! I’m not understanding the latest outrage at the discovery that Rob Ford’s mayoral campaign team employed a fake Twitter account. Unless they used the account to libel, of course. I’m not sure why more campaigns didn’t employ this strategy. I wrote to Alberta Environment Minister Rob Renner two weeks ago inquiring what, if any, plan the Alberta Government had to deal with a tailings breach. The answer is not surprising. In the letter, Renner provides few details to support broad statements such as Alberta tailings ponds are carefully regulated and the province has a strategy that can adequately deal with a tailings breach. This Pembina Institute document (pages 19-24) and blog post outlines the history of tailings breaches in Alberta, what the consequences of a new tailings breach would be, and the lack of government transparency with respect to provincial regulations governing tailings ponds, pond safety and breach response plans. 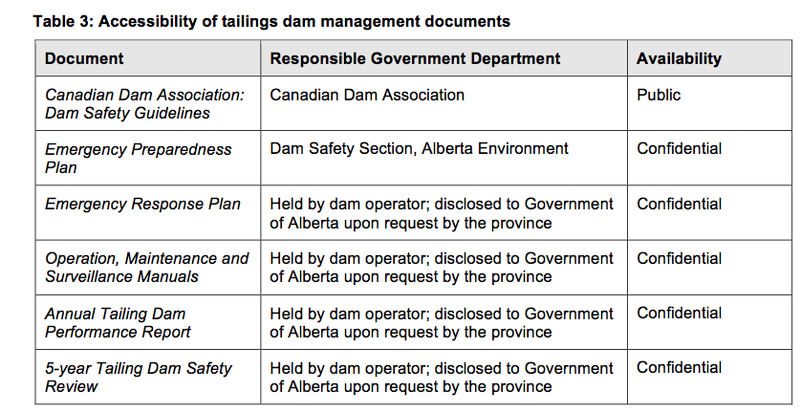 As the chart below clearly indicates, since much of the regulations, safety assessments, and emergency response plans are kept secret, the Alberta Government and Oilsands Industry are the only one who know how safe the tailings ponds are, who’s at risk if a breach occurs, and how prepared we are to respond to a breach. In an interview I had with renowned ecologist Dr. David Schindler, he stressed that a breach would have catastrophic consequences, particularly if one occurred during the winter. According to Schindler, a breach in winter would allow the toxins to be submerged under the ice for at least four months before any recovery operation could begin. This is because there is no known way to clean a tailings breach under ice. Consequently, pollutants would easily disperse, being “in Lake Athabasca in about a week, all the way down the Slave within three to four, probably in much of the Mackenzie after that.” Meaning, not only would a tailings breach effect downstream communities in northern Alberta, but also in the Northwest Territories. If all oilsands companies that operate tailings ponds are mandated to provide each “group” downstream (which I interpret to mean oilsands companies — though I’m not sure since the wording is ambiguous) with a copy of their Emergency Preparedness Plan, how come Albertans as a whole are not allowed similar access? As the Pembina Institute points out, current provincial legislation allows companies to keep these plans private. Shouldn’t downstream communities be aware of the risk they are placed in and what measures oilsands companies have in case of a breach? Further, if Dr. Schindler is correct and a tailings breach in winter would allow pollutants to travel rapidly without an opportunity to stop the spread for months, should the Alberta Government not share this information with the Northwest Territories? In the wake of more ducks landing in Northern Alberta tailings ponds this week, many have called on the province and industry to eradicate wet tailings ponds quicker. Seldom attention is paid to the larger consequences of tailings ponds, as well as the risk they pose to surrounding communities — particularly if a breach occurred. To me, this is a more compelling reason to phase out wet tailings ponds immediately. 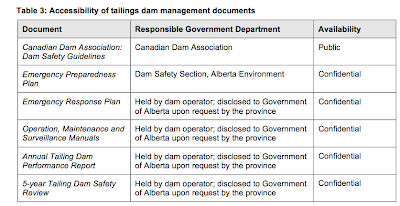 UPDATE: Alex Denonville, a reporter with the Slave River Journal, is reporting that the Alberta Government’s Canadian Dam Association: Dam Safety Guidelines is only available for a $60 fee. Why the steep fee when the document is in the public interest? It should be easily accessible by all.